Geometric Design is usually part of the content of the ‘Technical Drawing’ course, which is taught to technical high school students and to some college students. Its purpose is to study the flat geometric figures, which can be drawn with the help of ruler and compass, and the solids whose faces form these figures. The strategy for their teaching is usually to practice the classic procedures for solving concrete problems. It lacks prerequisites, the data it works with are true propositions within a logical system, and its legacy is spatial reasoning and visualization. Even so, this is one of the disciplines that make most students fail in the first year of technical high school. The main aim of this article is to discuss the interactive CD-ROM using multimedia technology for the teaching of Geometric Design – “The Geometric Design in Multimedia” (available for free download at Prof. Eduardo J. Stefanelli’s portal www.stefanelli.eng.br). Telecommunication and TI have drastically altered the expectations of the young people who reach second grade, because, accustomed to obtaining information around the world, following their curiosity and only with the effort of the touch of a finger (whether on the keyboard, mouse or remote control ), they are shocked when they arrive at school. In it they find the same teaching conditions used since the beginning of the last century: teacher-centered teaching, which was respected for being the holder of all knowledge and whose main tools of work were their voice and chalkboard. The school was the only place that allowed the student to know something beyond what he saw and heard in his day-to-day life. The knowledge of letters, sciences, history and geography was the teacher’s monopoly and the only possibility of social ascension passed through their banks. Today the school has changed, is seen as a punishment by these young people, frustrating their expectations, different from the world of discoveries and achievements that it should be. Added to this is the radical change in the way technology is generated and distributed. It is estimated that by the turn of the century, in the First World countries, the majority of the population will somehow be working with information. It is undeniable that the number of scientists working and producing today is unparalleled in the history of mankind, and as a result we are living what analysts have called the “information age” (LINDSTROM R., 1996): where the quantity of knowledge doubles in a prodigious way, resulting in the rapid aging of this knowledge and, in tow, the increasingly frequent need for technological updating of professionals and teachers. The aim of this article is to discuss the feasibility of a computer program capable of teaching geometric design and that is both motivating and self instructive; That allows the student to interact with it by arousing his curiosity and learning by following his rhythm; That has tools that allow the evaluation of the student, that is rich of stimuli and that emphasizes the learning. Having in mind the considerations above, a group of researchers from the Nucleus of Research of the New Technologies of Communication Applied to Communication The School of the Future of USP, coordinated by Prof. Alexander Joseph Romiszowski and sponsored by the CNPQ, began researching a self-instructive, motivating teaching way that would allow its user to update themselves anytime, anywhere. There was some concern that this milieu was rich in challenges and motivations, while removing the responsibility of teaching from the teacher and allowing him a position, in our point of view, nobler: that of mentor. As a result of this research we conclude that the computer would be the ideal tool for this purpose, since it allows the archiving of data through multiple communication resources – sound, still and moving images, texts, hypertexts – and enables the retrieval of this information in a multisensorial way And integrated. Another advantage of the computer over the various media surveyed is the ‘patience’ in accepting the repetition of the exercise or explanation, until the student appropriates the treated content. And more: with its cheapening most high schools are receiving these equipments. The term ‘multimedia’ was used for the first time to describe the transmission of information using multiple media or multiple senses. “In its broadest sense, the term ‘multimedia’ refers to the presentation or retrieval of information that is done with a computer aided, multi-sensory, integrated, intuitive and interactive way.” (Chaves E., 1991). The multisensorial presentation means that more than one human sense is involved in the process, a fact that may require the use of means of communication that until recently, were rarely used in a coordinated and integrated way. What was done until then, with the use of audiovisual resources, was the presentation of information in a juxtaposed way, since only two senses were involved in the process, “leaving aside the tactile dimension of multimedia, because with the help of the mouse, we can “play” in the program we are executing “(Chaves E., 1991). This property was only achieved thanks to the modern computer’s ability to store, process and transmit information in the form of: sound, image, text, etc. In nature most of the events they witness are accompanied by a sound; That is why we should use it as a powerful ally in getting attention to the student. “With a digital sound capability, we have access not only to the powerful manifestos of the narration, but also to the subliminal influences of the effects of music” (LINDSTROM R., 1996). The computer allows the archiving of still or moving images, treating them like any other type of data, but modern computers allow to demonstrate these images on the screen with an admirable quality. One of the most powerful possibilities, in our view, in multimedia is to add moving images. This feature allows us to draw the student’s attention to the point of the screen at the right time, to emphasize texts or events, or to demonstrate phenomena through animations and simulations that could otherwise be very expensive or dangerous. “Written words are descriptive, detailed and straightforward,” (LINDSTROM R., 1996) but the computer screen is not the most suitable place for reading because the screen resolution is undeniably smaller than the resolution of printed media. The use of scrollbars is unpleasant, turning the pleasure of reading into a sacrifice, light directed directly into the eyes makes the reading tiresome compared to indirect light on the printed page. However, it was necessary to adapt this powerful way of transmitting information to the multimedia environment. Hypermedia is an extension of the concept of hypertext, because, in addition to interconnecting texts through hotwords, it also interconnects new media, such as photos, sounds, movies, etc. (Figure 2). Interaction is the reason for existing of multimedia. It is the property of an application that “allows the user to ask questions or direct the flow of program execution.” (BADGETT T., 1994). “The power of interactivity lies in the ability of all parties to express their interests and communicate their concerns.” (LINDSTROM R., 1996). Applying this knowledge and as a result of the research, our group developed the software “Geometric Design in Multimedia”. It is divided into three applications: “Encyclopedia”, “Virtual Clipboard” and “Game”. Each application is accessed through its respective icon of the “Geometric Drawing in Multimedia” program group, which is automatically created in Windows at the time of installation. The “Encyclopaedia” contains the theory of Geometry, divided into topics: Point, Straight, Plane, Parallel Retakes, Competitors, Reverses, Circumference, Polygons, etc. The theory is presented in the form of two-dimensional and three-dimensional animations, hypertexts, drawings and narrations. By the “Encyclopedia”, the student also has access to the “Virtual Clipboard”. The navigation through this application is done in a free, non-linear way, stimulating the curiosity of the student or following the guidance of the teacher. In the “Encyclopedia” module the contents are explained, the classic procedures are demonstrated, access to hypertexts, glossaries, examples, exercises, comparisons, etc. 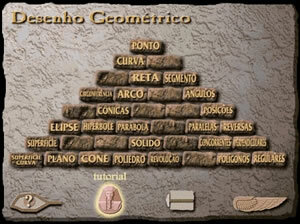 When opening the “Encyclopedia” the student finds the interface seen in screen 1 – the so-called ‘pyramid of stones’. In it, the student selects the subject of the geometry that wants to interact, has access to the help, and also to the tutorial – that demonstrates the use of the program. It is also from this screen that you leave the program. The “Virtual Clipboard” is the graphical environment that simulates the use of a real drawing board, that is, the same procedures used to execute a drawing with the help of the instruments – ruler and compass – should be repeated in this environment. This is where the student solves the exercises of the Geometric Drawing. As it happens when a student uses a real drawing board, the “Virtual Drawing Board” contains an area for drawing and the usual work tools, ie, pencil, ruler, eraser, and compass. As in Geometric Drawing there is essentially no use of measures, there is no ruler with scales. (Screen 3). As the purpose of this graphical environment is to simulate the use of a real clipboard, there is no tool that automatically constructs a geometric figure or solves a problem. The student should solve the exercises as he does in the absence of the computer. He does, however, have some facilities that he does not find on the traditional drawing board. The student counts, for example, with buttons to save the content of his work, to open others already made previously and to print. There are other clear advantages in the “Virtual Clipboard”, such as the use of rubber: it leaves no trace. The “Virtual Clipboard” can be used from three different modules. In the first module, it works as if it were a real drawing board – an environment that simulates the use of ruler and compass its goal is to practice the solutions. In the second, the “procedure” module, it acts as a tutorial, which demonstrates step-by-step the classic procedures for solving geometric problems. And in the third, the “exercise” module, the student solves an exercise and the “board” assesses if it is correct. This happens thanks to an algorithm that isolates the objects created by the student and compares their attributes – angle and position for example – with the expected attributes. For example, for the determination of a line parallel to a given line by a given point, the program identifies whether a “straight” object has been created that has the following attributes: is positioned ‘on’ the given point and, at the same time, Has the same slope as the given line. The “Virtual Clipboard” also has a tutorial and online help to facilitate the understanding of its use. In the course of developing the “Virtual Clipboard” we perceive a serious problem. Due to the technical limitations of video monitor resolution, the user could not create a line, or another object, exactly from the intersection of two lines. The succession of errors generated by the poor positioning of the points, during the solution of the exercise, led the program to interpret as wrong a technically correct exercise. The implemented solution was to automatically generate a new object – a dot – at the intersection of two lines, with the property of attracting the cursor. This characteristic forced the proper positioning of the “virtual drawing instrument” in the correct points. The objective of obtaining maximum accuracy was achieved, since the program improved its success rate when evaluating the exercise. In the “Game” the student follows a guided and linear navigation, whose sequence is given as a prerequisite, ie, the student can not enter the topic “Parallel Retains” without first having mastered the contents of the topic “Reasons”. The student gains the right to advance to the next topic by answering the enigma of the Sphinx, which is an evaluation of the concepts dealt with in the current topic. The use of the game is justified by its playful and motivating aspect. His metaphor is the imprisonment of the student in a pyramid in Egypt, where he will pass through various rooms. Each room contains one of the topics of Geometric Design. The student will be free when answering the questions of the Sphinx or when solving the proposed exercises, unraveling the enigma of the pyramid. Basically the “Game” has the same structure as the “Encyclopedia”, the main differences are: the impossibility of free interaction with the program – because the hot words will only refer the student to familiar subjects and the subjects not covered are disabled in the pyramid of stones; And when the student tries to advance to the next topic the screen of evaluation is activated: the screen of the Sphinx (screen 4). As we mentioned at the beginning of this article, when we started the research, our great uncertainty was whether the computer could be used as an instrument for the teaching of Geometric Design, considering the intrinsic difficulty in evaluating an exercise. We started the research of the possibilities of Informatics and began to produce a graphic environment that resulted in the “Virtual Clipboard”. At the end of this stage, we started to investigate the possibility of this program not only being an exercise building environment, but also being a tutor in teaching the classic procedures and being able to analyze if the exercises would be correct. In parallel, we researched how to use the potential of the computer to teach the concepts of Geometric Design. One of the techniques investigated, which proved to be quite profitable, was the mapping of information, because it provided us with short and clear texts. Another technique was the 2D animation that allowed us to demonstrate the classic procedures for solving geometric problems. Moreover, the technique of 3D animation allowed the visualization, in space, of the examples of the subjects treated; The comparison, through transformations of geometric entities into everyday objects; The learning of the proper use of the drawing material in obtaining the geometric entities; The clarification of any doubts in demonstrating counter-examples; Always taking care to observe if the student is mastering these concepts through conceptual exercises and procedures. All done with the utmost attention to make work attractive. Because of the technical limitations of video monitor resolution, we have developed a way to increase accuracy during exercise solutions, since the succession of errors compromised its quality, causing the program to interpret a technically correct exercise as incorrect. To this end we develop a routine that draws the cursor at intersections of lines, ensuring that the student will always click on the appropriate point. Our team spared no effort to run a full hypermedia program, so much so that it deals with twenty-five subjects distributed in one hundred and seventy-four pages, with two hundred and seventy 3D animations, twenty-six technical procedures, thirty one exercises, tutorials, narration, glossary, hypertext, help etc. The techniques researched during this period proved to be quite effective for the production of interactive educational programs, but also for the preparation of lectures, as they add a new dimension – from the conventional chalkboard plan – to the subjects dealt with by teachers in the classroom , serving as a powerful tool for these professionals. In addition to the coordinator of the group Prof. Alexander Joseph Romiszowski, the team was formed by programmer Prof. Delmar Galisi Domingues, by graphic artist Mauricio Pirillo, also creator of 3D animations, by Prof. Eduardo José Stefanelli, author and content of the work, and by the trainee Leandro Galdino de Almeida.